The silver fern – what is it? The silver fern is one of the favoured symbols for a new flag. 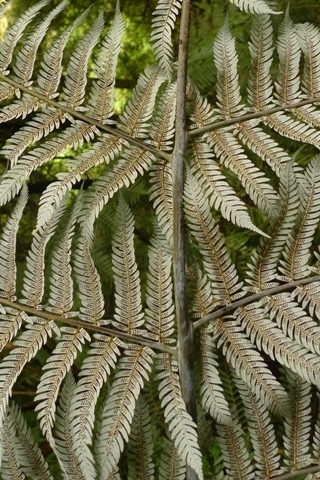 Aside from being one of New Zealand’s icons, the silver fern is a real plant. But being on a nation’s flag deserves a background check – what is the silver fern? Close-up of the white frond-underside of a silver fern. The brown circles are the reproductive structures, which produce spores. Photo Leon Perrie. (c) Te Papa. It’s also known as ponga (the Maori name) and Cyathea dealbata or Alsophila tricolor (alternative scientific names). White frond-underside of a silver fern. Photo Leon Perrie, (c) Te Papa. The upperside of the frond is a vibrant green, and the axes are prominently yellow. Photo Leon Perrie. (c) Te Papa. 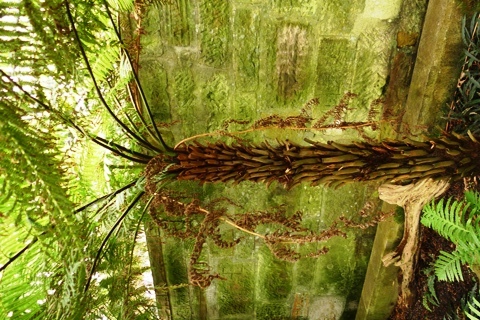 It’s a scaly tree fern, with a trunk up to around 10 m tall. There are two principal kinds of tree ferns – scaly and hairy. 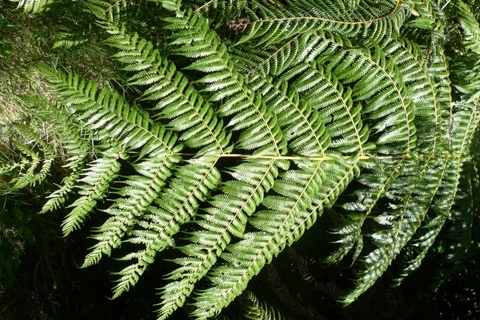 For more, see Te Papa’s guide to New Zealand’s tree ferns. 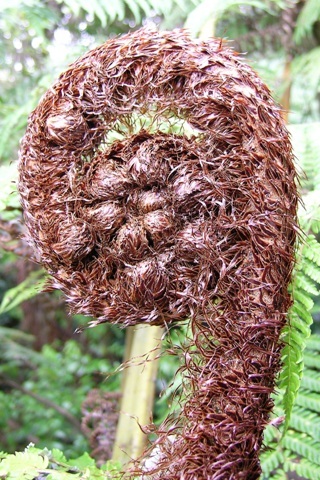 A koru, or unfurling young frond of a silver fern, with a dense covering of scales. Photo (c) Leon Perrie. 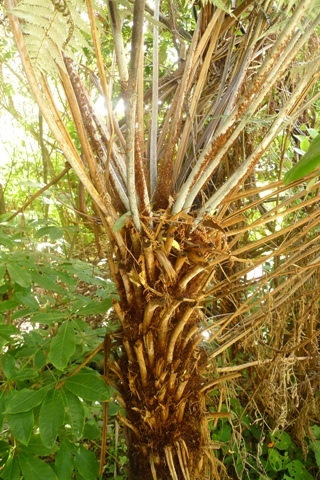 The underside of the fronds is white in most bigger plants. ‘White fern’ would be a more accurate moniker than silver fern. Juveniles start off with a green underside, with the whiteness usually evident by the time the trunk starts to form. The whiteness is poorly developed in many Northland plants, even in adults, which are instead silver or nearly green. Perhaps the silver fern label originated in the north. Many Northland plants have silver (or even green) frond-undersides, rather than white. Photo (c) Leon Perrie. The white or silver colouring extends to the frond stalks, meaning silver ferns are easily identified by their trunks alone. The frond stalks are whitish, making silver fern easy to identify even at a distance. Photo Leon Perrie. (c) Te Papa. It is widespread and common in the North Island. In the South Island, it occurs in the very north and sparingly along the east coast, but is absent from the west and south. Te Papa’s collections of silver fern specimens, with map. Silver ferns prefer warm, dry habitats, contrasting with the other prominent tree ferns in New Zealand: mamaku – warm & wet; katote – cool & wet; wheki – wet ground; wheki-ponga – cool & dry. But it is not unusual to find most/all of these species in close proximity. Silver ferns flourish under teatree (manuka/kanuka) and other scrubs in the northern lowlands. Traditional uses of ponga included as building material, treating skin problems, marking tracks for night-time use, and the trunk’s woody fibre was used to make poisonous spear tips. The silver fern is indigenous only to New Zealand (North and South Islands, and many of the offshore islands, as well as the Chatham Islands). 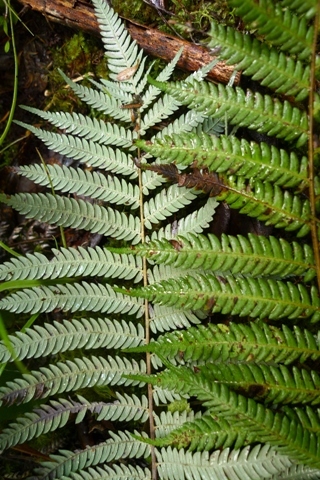 A very similar species, Cyathea milnei, occurs on the Kermadec Islands to the north-east of the North Island. However, its frond undersides are green rather than white/silver. 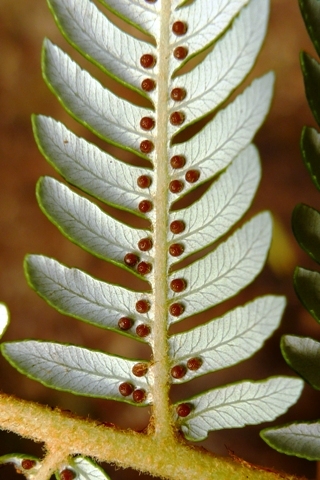 Another similar and seemingly closely related species, Cyathea australis, occurs in Australia and Norfolk Island. Its frond undersides are also green rather than white/silver. Additionally, its reproductive structures are naked rather than demurely covered as in the silver fern. The Australian Cyathea australis is a similar and related tree fern. This plant is in the Botanic Gardens in Sydney. Photo Leon Perrie. (c) Te Papa. Any new idea is a good thing,it is after all not the only flag that New Zealand have ever had. We should of course respect all that has been done for New Zealand freedom,how Ever these men and woman fought for freedom of everything and moving forward not staying in the past. As a new,New Zealander I would like to see a unified flag as we are a people from all over the world and the flag should represent all of us.kiwis as that is what we all are. to me the SILVER FERN really represents Sports Teams in NZ, not a national flag. Both WW1 and WW2 the soldiers from New Zealand, fought under our present day FLAG with the Union Jack on, wonder what they would comment on the idea of a new Flag for their Country? What about the lovely flag going back to Waitangi era? Is the silver fern the best choice for a new flag when it doesn’t exist in parts of NZ and therfore can’t be representative of the whole nation? Many of us have a very close association with Britain and will always do so due to pakeha settlement, involvement in wars, our language etc. If a change is needed a new flag should represent both our cultures. Were you referring to the United Tribes Flag that was selected in 1834? That silver fern does not occur everywhere in New Zealand might be something that gets considered. The so-called “NEW ZEALAND Christmas tree” = pohutukawa presents a similar case, being native only to the north of the North Island, although it is widely planted and the related rata trees substitute for it elsewhere. Few native NZ plants and animals occur throughout New Zealand. The silver fern was first worn by NZ soldiers in the Boer War.